LEGO Ninja Turtles Kraang Lab Escape features a laser shield prison with explosion function, The Kraang’s mech walker. Includes 3 minifigures: Michelangelo, Foot Soldier and 1 character : The Kraang…. In this Ninja Turtles LEGO set, The Kraang has Michelangelo locked tight in a laser shield prison. Use left over pizza to make the foot soldier slip and fall, allowing Michelangelo to make a slick escape! Be ready for a wild ride as The Kraang detaches the mech walkers legs to create a flying escape pod! LEGO model number: 79100: Give the villains the slip with a hot slice of Turtle Power! Activate the explosion function on Michelangelo’s cage to escape. Once he’s free, battle The Kraang in his awesome mech walker with dual laser flick missiles. Includes 3 LEGO minifigures – Michelangelo, a foot soldier and The Kraang. For ages 6 years and over; EAN: 5702014972452. WARNING(S): Not suitable for children under 3 years old. 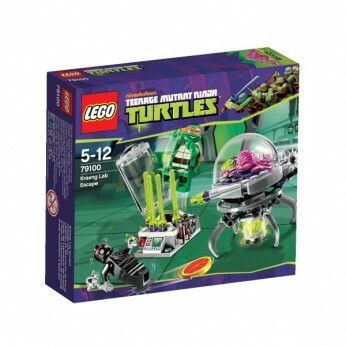 This toy costs approximately £9.99 (for the latest and best prices make sure you check our retailer list for the LEGO Turtles Kraang Lab Escape 79100 above). In our review of LEGO Turtles Kraang Lab Escape 79100 we classed it as being suitable for ages 4 years, 5 years, 6 years, 7 years, 8 years but recommend you check the manufacturer specific advice before purchasing.